What comes to your mind when Memorial Day comes around? For many of us (myself included), Memorial Day marks the beginning of summer. This means flip-flops, barbequing hamburgers and hot dogs, picnics, homemade ice cream, and ice cold buckets of beer. For most American children, it means that school is almost out. And of course, for many of us, it is a three-day weekend that we spend with our friends and families. Over time, many of these holidays seem to lose their meaning and importance for a lot of people. Of course, I enjoy all of the above-mentioned aspects of Memorial Day as much as the next person. But Memorial Day holds a lot more meaning than that. Memorial Day is a day of reflection and of rememberance. It is a day to honor those who have given their lives defending the freedoms that we as Americans enjoy every day, and sometimes even fighting for those freedoms for people in other countries. Regardless of political views on war, we are all so profoundly indebted to these soldiers. In honor of their sacrifice, Memorial Day should give us an opportunity to reflect on the most sacred of human ideals: family, faith, honor, commitment, and heroism. There are a lot of traditions that accompany this day. Parades often are held. A “National Moment of Rememberance” is held at 3 p.m., giving Americans a chance to pause and think about the true meaning of the day, and for Taps to be played. The graves of our fallen heroes are decorated and visited. According to the U.S. Department of Veterans Affairs, flags are to be flown at half-staff from sunrise until noon, and then briskly raised to the top of the staff until sunset, in order to honor our nation’s battle heroes. Artificial poppies, produced by veterans at Department of Veterans Affairs medical facilities and veterans homes, are distributed throughout the country. Donations received for these artificial poppies are to help veterans and their widows, widowers, and orphans. However you choose to celebrate Memorial Day, whether it’s with a beer in hand, grilling a hamburger, or enjoying a picnic with your family or friends, take a moment to remember its true meaning, and honor those who have given their lives for our country. If you’re looking for a dish to bring to a celebration, why not coleslaw? This isn’t just “any ol'” coleslaw, however. I was inspired by Elise’s Southwestern Coleslaw at Simply Recipes and decided I’d make a similar version. I changed it up a bit by using red cabbage, and made a mayonnaise-based dressing. The dressing actually is quite light on this coleslaw. (I hate coleslaws where the mayo overwhelms the dish!) I also added some fresh sweet corn, cut right from the cob. The garlic greens came from my garden, (I didn’t have a green onion handy, and thought this would make a tasty substitute) but I’m sure you can find green onions much more easily in the grocery. I was so happy with this rendition of coleslaw, I plan to make it several times throughout the summer. It was a breeze to put together, and was so bright with flavors, thanks to the cilantro and hint of lime, and so deliciously crunchy! I couldn’t stop eating it as soon as I tossed the ingredients together! Place cabbage, carrots, radishes, corn, garlic greens, and cilantro in a large bowl and toss to mix. In a separate bowl, mix mayonnaise, chipotle powder, sugar, and lime juice. Toss cabbage mixture with dressing, and season to taste with black pepper. I served it with some polish sausages (simmered in beer, onions, and caraway seeds, and then pan-fried), and oven-roasted red potatoes. However, it dawned on me, halfway through dinner, that this cabbage recipe would be splendid with a simple pan-fried pork chop. It has a delicious flavor…I couldn’t stop munching on it even as I was putting away leftovers. Guess I’ll have to make this more often! Update: I ate leftovers with a sauteed pork chop! Tasty, I highly recommend it! In a medium-large saucepan over medium heat, melt the butter. Add a handful or two of the cabbage, and stir to wilt. Add a bit of salt and pepper. After a few seconds, add another handful, and stir to wilt. Add another bit of salt and pepper. Repeat until all of the cabbage is in the saucepan. Wilt for 3-4 more minutes, stirring occasionally. Add caraway seed, and stir and cook for another minute. Add balsamic vinegar and stir, and finally stir in agave syrup or sugar. 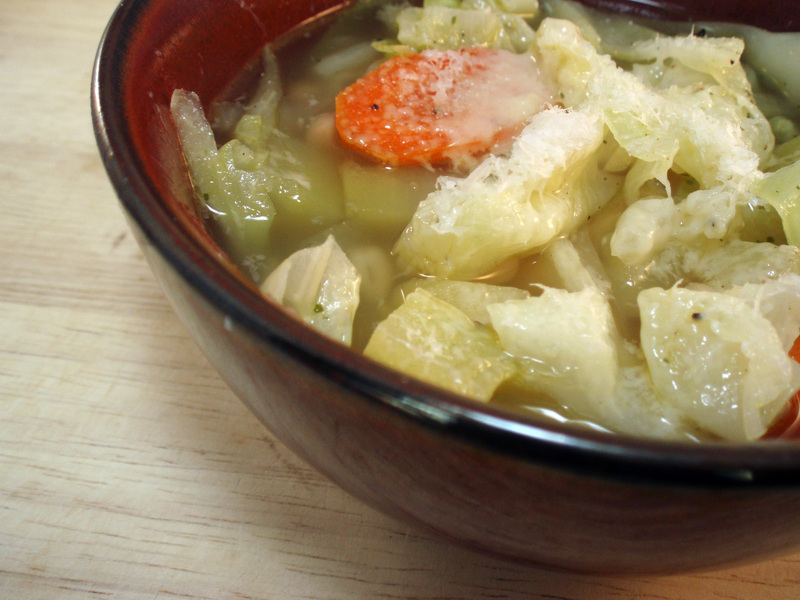 Simmer on medium-low, partially covered, for 30-40 minutes or until cabbage is tender. Taste and adjust seasoning as necessary.